Ina is in Denmark all week, so I'm filling in for the next few days. Let's get right to Apple, shall we? Apple's reputation for launching products that transform entire markets could become a casualty of its transition from selling gadgets to peddling "services" — the company's catch-all label for the grab bag of TV, news media and gaming bundles it announced Monday. Why it matters: Apple's genius under Steve Jobs lay in focusing on a very small number of unique products, but its new offerings are scattershot additions to already crowded media marketplaces. Some may prove hits, others may flounder — but none of them look poised to "change the world," no matter how many times Apple and its partners repeat that phrase. Between the lines: Apple's event featured one speaker after another — from CEO Tim Cook and other Apple execs to Steven Spielberg and Oprah Winfrey — lauding what Cook called "the power of creativity" to "move us and inspire us, surprise us and challenge our assumptions." 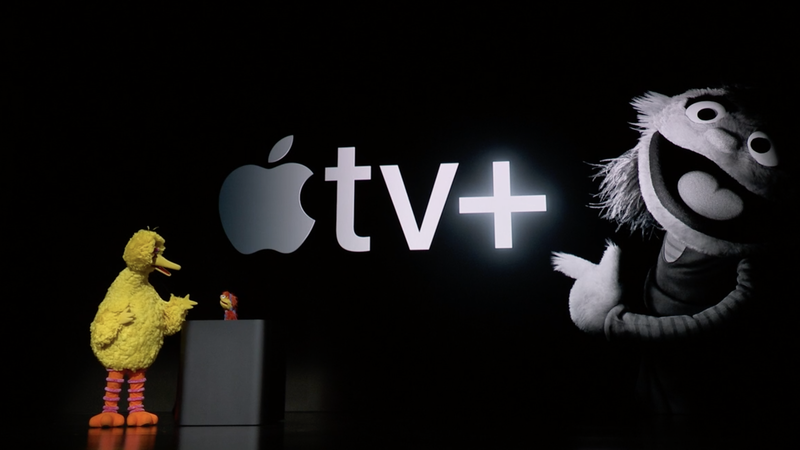 The formidable array of directors, actors, musicians and other artists who are contributing their work to Apple TV+, the new premium content service, are fully capable of doing those things. But so are many of their peers currently working for Netflix, Amazon and other content studios. A distributor is a distributor: Consumers are no more likely to choose a show based on which streaming network it's on, than to choose one based on which broadcast network is offering it. Ditto for movie studios and book publishers. Reality check: Apple is touting privacy and security as differentiators for all its offerings. Each of its product intros ritually promised not to sell users' personal information, and each pledge evoked cheers from the crowd in Cupertino. Privacy controversies for Facebook and other online giants have raised public concern, leaving Apple an opening. But there's little evidence so far that entertainment consumers will make choices based on privacy concerns. In the Jobs era, Apple made a point of not announcing products till they were ready to ship. But many of the media offerings unveiled yesterday lacked basic details on pricing, timing and lineup — and won't be available for months. Apple's new "services" focus will rise and fall on the ability of the company's developers and designers to write great, reliable software. In recent years, Apple's hardware designs have continued to dazzle while its software has often languished. Apple's phones and computers are premium brands for which people pay premium prices. But the world of services is one of monthly fees that get sliced into slivers by multiple stakeholders. The bottom line: Apple's "services" pivot is already making the company fresh billions, and it will likely make more over time. But it also risks bringing Apple's lofty brand down to earth. Go deeper: Axios' Sara Fischer and Kia Kokalitcheva dissect Apple's services master plan. Most Apple products are expensive — you want them, but you hate how much you're forced to pay for them, Axios' Felix Salmon writes. They often use premium materials, too. What's new: When the titanium PowerBook was launched in January 2001, it started at $2,599 — $3,750 in today's dollars. The titanium Apple Card, by contrast, announced Monday as part of Apple's larger media push, is entirely free. For the unbeatable price of $0, customers will be able to flex a gorgeous minimalist card — so minimalist, in fact, that it comes without normally-standard features like a card number or an expiration date. Instead, you can generate one-off numbers on your phone. Apple has partnered with Goldman Sachs for this product, although the Goldman logo is relegated to the rear of the card. Goldman bought Final last year, a company which specialized in generating new credit card numbers off a single account; it also bought Clarity, which specializes in spend tracking and analysis. Both of those features are core to the Apple Card, the workings of which are also woven tightly with Apple Pay. The all-important underwriting process is going to be on Goldman. When you tap your phone to apply for the card, Goldman will have to instantaneously decide how creditworthy you are, how much of a credit line it will offer you, and how much interest it will charge. Why it matters: This is an ambitious attempt by both Goldman and Apple to break into the world of consumer finance. But gaining significant market share from the giants in the space will not be easy. Timing: The card won't be available till summer. Apple didn't announce interest rates and other key details. Just one day after protesting drivers forced Lyft to move its IPO roadshow meeting in San Francisco (while others went on strike in Los Angeles after Lyft competitor Uber cut its per-mile pay rates), the company is announcing new, long-planned initiatives it says are aimed at reducing drivers’ expenses, Kia writes. The big picture: As Lyft prepares to go public, it’s still grappling with ride-hailing drivers’ top complaint: insufficient earnings. The company is aiming to help them not by giving them a bigger slice of their fares (which it could do by cutting its commissions), but rather by cutting the drivers' costs. Vehicle service centers: Lyft is revamping its driver hubs, adding car repair services it says will be much cheaper for drivers (Lyft will price them at cost, according to COO Jon McNeill). It’s also adding services drivers can book via their smartphones. Why it matters: Lyft’s new initiatives aren’t just an effort to offset complaints about wages — they're also critical as it continues to battle for drivers’ loyalty. Acquiring new drivers is costly for both Uber and Lyft, so any perks that keep a driver happy and driving for longer helps the companies’ bottom lines. Just last year, Lyft’s net losses totaled nearly $1 billion, as its IPO filing recently revealed. The tech sector added 260,000 U.S. jobs in 2018, according to industry group CompTIA, a slight increase over the previous year. With a total increase in the U.S. workforce of 2.6 million for 2018, that makes tech responsible for about 10% of total U.S. job growth. Tech's total of 11.8 million workers make up 7.6% of the U.S. workforce, but they're responsible for 10% of the total U.S. economy. The top 5 states for net tech employment gains during the year were California (51,567), Florida (18,147), Texas (17,855), North Carolina (13,773) and New York (13,732). The median wage in tech was $81,907, 92% higher than the median national wage. Go deeper: CompTIA's Cyberstates guide has more details and an interactive map. Axios' Dan Primack offers a close look at WeWork's latest financials. Did you see the one about the Texas longhorn steer that walked into a pet shop?